Oxygen therapy is administered liberally to give a margin of safety against life-threatening hypoxia; however, excessive supplementary oxygen may increase the risk of serious adverse events with a potential negative impact on both morbidity and mortality. This review focuses on the current evidence and emerging data relating to oxygen therapy in the perioperative setting. 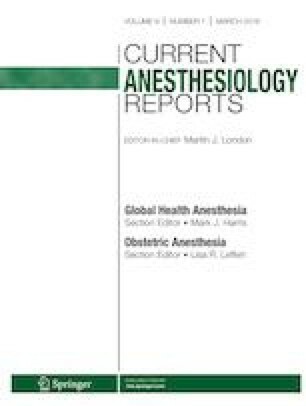 Current controversies around evidence-based guidelines for perioperative oxygen therapy present a serious challenge for anesthetists. Recommendations vary from very high fractions of inspired oxygen for prevention of wound infections to targeting normoxemia for prevention of organ dysfunction. The relevance of emerging evidence of increased mortality with liberal oxygen therapy in acutely ill adults to the predominantly elective surgical population is unclear. However, recent data indicate that evidence to support liberal oxygen to prevent wound infections is frail, and so the potential that liberal oxygen therapy might cause harm is of particular concern. While optimal oxygenation targets are a matter of debate, defining upper limits of acceptable arterial oxygenation perioperatively in surgical patients to reduce tissue injury induced by hyperoxemia is a reasonable approach. Bodil S. Rasmussen, Daniel Frei, Olav L. Schjørring, Christian S. Meyhoff and Paul J. Young contributed equally to this work. Bodil S. Rasmussen is the chief investigator for the HOT-ICU trial, which is a multinational randomized controlled trial comparing a higher versus a lower oxygenation target in critically ill patients with hypoxemic respiratory failure acutely admitted to the intensive care unit. Daniel Frei declares that he has no conflict of interest. Olav L. Schjørring is the coordinating investigator of the aforementioned HOT-ICU trial. Christian S. Meyhoff is the chief investigator for the VIXIE trial, a randomized controlled trial comparing perioperative oxygen fractions; site investigator in the HOT-ICU trial; co-author of several Cochrane reviews about oxygen therapy; and he was the primary investigator of the PROXI trial, a randomized controlled trial comparing perioperative oxygen fractions. Paul J. Young is the chief investigator for the ICU-ROX trial, a randomized controlled trial comparing conservative oxygen therapy with standard oxygen therapy in mechanically ventilated adults, and is the senior investigator for the HOT ROX trial, a feasibility study comparing restrictive oxygen, standard oxygen, and liberal oxygen in adults undergoing major surgery. •• Myles PS, Carlisle JB, Scarr B. Evidence for compromised data integrity in studies of liberal peri-operative inspired oxygen. Anaesthesia. 2019. https://doi.org/10.1111/anae.14584 Evidence for compromised data integrity in the studies of the 2016 WHO guidelines.